This interview is part of our ongoing conversation with innovators in the hydrogen distribution space. Hydrogen distribution is a key element in the success of market adoption of hydrogen technology. 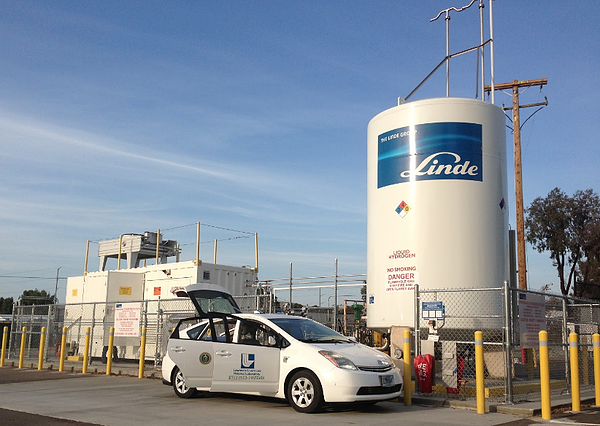 Recently, we had the opportunity to talk with Guillaume Petitpas at Lawrence Livermore National Laboratory (LLNL), to discuss the organization’s research and development around hydrogen fuel distribution. The Laboratory’s science and engineering are being applied to achieve breakthroughs in diverse areas, including energy and environmental security. They are proud to work with the United States’ very best scientists and engineers. 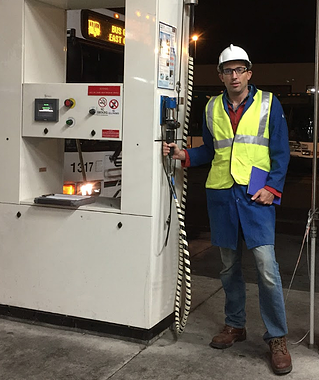 What are the current adoption challenges for hydrogen in the heavy duty vehicle market? what the gaps are in the R & D now. What is the current involvement of Livermore National Laboratory in hydrogen and heavy duty vehicles? At LLNL we've been doing R&D on hydrogen for transportation for almost two decades now, developing an innovative technique to affordably store a lot of hydrogen on board a vehicle. Hydrogen becomes affordable when you go large scale. So there's two things. The first is the efficient production of hydrogen, and the second is the distribution of hydrogen to the vehicle network. So can you tell us a bit more about your technology and what is unique compared to the standard compressed hydrogen systems in place right now? Our whole focus is on distribution. There are different ways to make hydrogen more compact, including high pressure, and different chemical reactions. Liquefaction is a process that’s well known in the industry. They’ve been liquefying hydrogen for more than 60 years, especially for the NASA rocket program. It’s a very good way to make hydrogen much more compact, so you can distribute it more easily. You can store much more in one truck and you get much more energy per truck when it's liquid, rather than a gas. For example, to deliver the same amount of energy with hydrogen as a gas, we need 5 to 15 times more trucks. And that alone is one of the strongest arguments for delivering hydrogen as a liquid to the station. 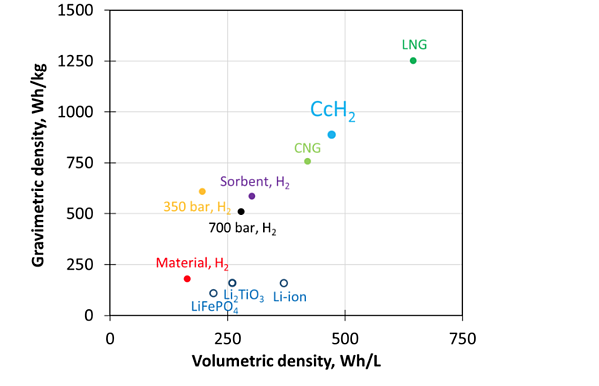 The figure below shows a comparison of the gravimetric and volumetric energy density vs. competing low and zero-emission technology. So hydrogen is put onboard the vehicle in a liquid state, and then it needs to be transformed from a liquid state into the state that the vehicle needs for the propulsion or the energy source. Is that correct? So how it works is actually a bit different. We don't store liquid onboard the vehicle, as there is an issue with boil-off and the two phase transition. So what we do here is, we take liquid at the station and compress it at a cold temperature, onboard the truck or bus. And by doing that, we achieve high pressure and density with a small energy input. We’re talking about a 350 to 700 bar max pressure at 60 to 70 Kelvin, and because it’s so cold we still have very high density. And then when we want to use it in the fuel cells, we need to vaporize it. Are the fueling times the same as conventional systems? We're using a commercial product that’s widely distributed - the one we use is made by Linde. The fueling system is actually faster than what we see today with gaseous hydrogen - and it’s more efficient. So as far as fueling time, it would be equal to or better than what the conventional fueling industry is doing today. Because it's much easier from an energy perspective to push molecules that are cold and compact, than it is to push to gaseous molecules. So in your view, how is this technology impactful for fuel cell applications, especially in the heavy duty trucks category? The range of any zero-emission vehicle is very important, and so is fueling time. For passenger cars, battery technologies can do well since most people don’t drive a lot everyday, and can charge overnight. Additionally, the mass of the battery is almost “transparent” to them, since most of time you only have one or two passengers in the vehicle. For heavy duty vehicles, such as buses and commercial freights, those issues of range, fueling time, and battery weight become much more of a challenge; since all those aspects have a direct impact on the economics of the application. That’s why hydrogen makes much more sense for large vehicles. Our technology actually enhances the value proposition of hydrogen, by maximizing the system density, and therefore, the range, while minimizing the mass. It also drastically reduces the capital cost of the filling station by up to two and-a-half times. Also, the cryogenic pump means the operating cost is lower, as it requires much less energy than a compressor. So what is your long term vision for hydrogen and mobility? We have to focus on scalability and affordability. It doesn't make sense to have a technology that isn't affordable. But the future will be hydrogen for sure. I think the way to get there is to take the approach of working with fleets. For example, indoor fuel cell forklifts are a great success story of the deployment of affordable and practical zero-emission solutions. So you make sure there’s some sort of sustained demand profile at the refueling location which, coupled with large capacities, can secure a long term contact with a supplier, and therefore, significant discounts. If you have a hydrogen station that fills 200 buses a day for 10 years, it will generate steady demand for five tonnes of hydrogen per day. So it's much more predictable to do commercial vehicle fleets and this is where the future of hydrogen is for the short-and-medium term - and of course for the long term. Hydrogen has the best value proposition for the long range and heavy duty cycle applications of trucks and buses. Do you have any other comments you would like to share with people about this technology? The frustrating thing is there's a mismatch between the pace of the research and the pace of the industry. Interestingly enough, the research is actually ahead of where the industry is going for this specific topic. The risk is that by the time hydrogen technologies are fully developed and commercialized, we may miss the opportunity to make hydrogen happen. Because if we don't have a very high performance system then, the market might not be interested in moving to hydrogen. But if we can finally offer what we think we can offer, then it's going to be a game changer for the industry. I would like to add that our technology shows that we can do better than CNG - this is the zero-emission technology that can be better than fossil fuel based technology. So from that perspective we have a strong case. Download the white paper below to see the results of our 16-hour simulation with a fuel cell-battery hybrid drayage truck against various drive cycles.